The gonfalon and the emblem were adopted on the 17th September 1984 with corrections on the 8th January 1986. The emblem is an octagon fimbriated in gold with nine fields. Four of them represent the Italian colors and the five other the coats of arms of the five provinces of the region in saltire. This is surrounded by laurel and olive branches and surmounted by a golden crown. 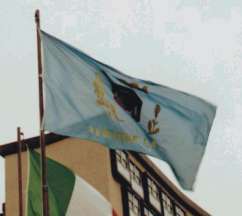 The gonfalon is sky blue with a dark blue border with the emblem in the middle. This last is surrounded by laurel and olive branches and surmounted by a golden crown. Under appear the words Regione Lazio in gold. There is not any official flag. The above flag of Lazio is not official. According to information recieved from Roberto Breschi, Latium flag has no dark blue borders. The inscription could be either in one or two raws. The flag is unofficial. At Novali Bandiere site it has a white background and no inscription. 1) there is no official flag, only official gonfalon, and in the gonfalon there aredark blue borders. Then seems that some unofficial flags exist: with four borders, with only two borders (upper and lower), with no borders, and with white background (and with different patterns of inscription). 2) I have a printed image of the original vector file from Roberto Breschi, and it has dark blue borders. Of course can be a mistake. 3) In private correspondence to me he signaled a flag light blue with arms, but without inscription. Currently I believe that the most correct flag is the one with four borders and golden inscription in two raws, following the official pattern of the gonfalon. Roberto Breschi showed me the same flag and stressed that it is a wrong one. As far as I remember, he said that the only flag "in use" has no borders. This photo was taken (by Alessandro Martinelli) in front of the building of the Regione Lazio offices: the flag ordinarily hoisted has no dark blue borders. The next issue of Vexilla Italica will offer a complete report dealing with this flag (and other five flags of Italian regions). According to commercial site at <www.flagsonline.it>, the flag is white with no inscription.